3 Nov: Hao's discussion section has been replaced by office hours on Fridays, 2-3, X568. 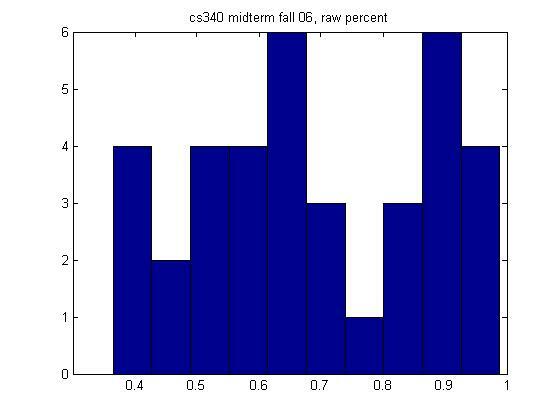 25 Oct: Midterm grades. These are raw percentages, not final marks. 11 Oct: The final exam date will be Mon Dec 11, 3:30-6 pm Dmp 110. Pattern Recognition and Machine Learning, Christopher M. Bishop, Springer 2006. The Elements of Statistical Learning, Trevor Hastie, Robert Tibshirani, Jerome Friedman, Springer 2001. We will follow Alpaydin's book (for the most part), with some supplemenary handouts. The class will cover supervised learning (classification and regression) and unsupervised learning (density estimation, i.e., clustering, dimensionality reduction). Applications/examples will be drawn from computer vision, computational biology, speech/language, etc. The class will involve a fair amount of math (linear algebra, calculus and basic probability/ statistics), but also a fair amount of hands-on coding (in Matlab). Reading material is abbreviated as follows: A = Alpaydin book, B = Bishop book, H = Hastie book. Lecture notes include material borrowed from a variety of authors. Please contact me before copying. Optional: Matlab for psychologists by Antonia Hamilton. Recommended: Matlab hints and tips by Kevin Murphy. Intro A chap 1 . Learning theory A 2.2, A 2.3 . HW2 by Mon Sep 25. The data/code is here. HW2 clarifications. Bayesian concept learning Refresher on probability. .
Bayesian concept learning . . Modeling discrete data with Bernoulli and multinomial distributions Optional: In praise of Bayes, Economist article, Sept 2000 . Naive Bayes classifiers Naive Bayes classifiers HW4 by Wed Oct 11. Code/data is here. Naive Bayes classifiers Optional: Better Bayesian [spam] filtering, Paul Graham, Jan 2003 . Markov chains . HW5 due Wed Oct 18. Code/data is here. Information theory Information theory . Info theory . No HW! Midterm postmortem Notation used so far in class. . Simulated annealing (hw 6) . .
Remembrance day holiday . .
Bayes nets Inference in graphical models . Plates and param learning A 3.7, Microsoft's mobile manager . Causality Simpson's paradox (extracted from the bn.pdf file) . Gaussians Gaussians, A 5.2-5.4 . Gaussian mixtures Mixture models, A ch 7 . Final exam DMP 110 3.30-6pm .